Have you recently purchased your first DSLR and feel a bit overwhelmed with all the various settings? 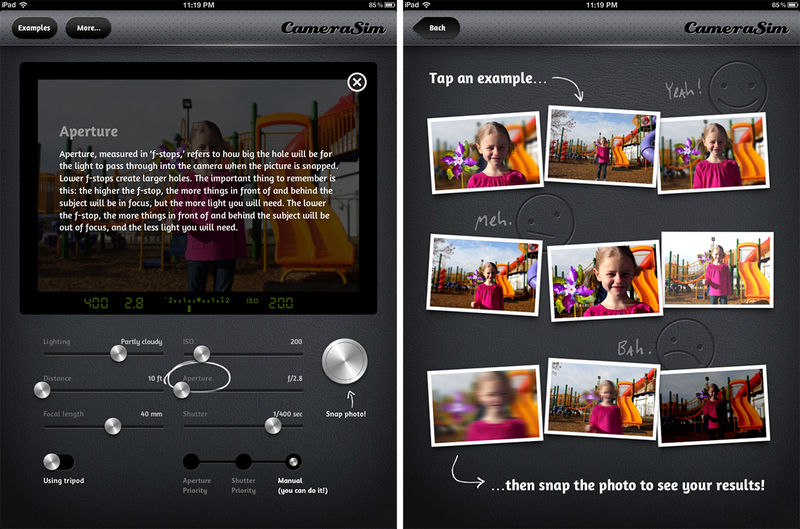 CameraSim for iPad will help you overcome your fear of venturing away from the auto mode of your camera by visually explaining how different controls affect your images. CameraSim essentially lets you simulate taking the same photo over and over again, but with different settings, and instantly shows you what you could expect the photo to look like. At the top of the app's main screen, you'll find your viewfinder, and in it you see a little girl swaying back and forth holding a pinwheel that's being spun by the wind. At the bottom of the viewfinder, you'll see a light meter and your current settings, just as you would in your DSLR's viewfinder. The bottom half of the screen gives you access to all your virtual camera settings and the shutter release button. 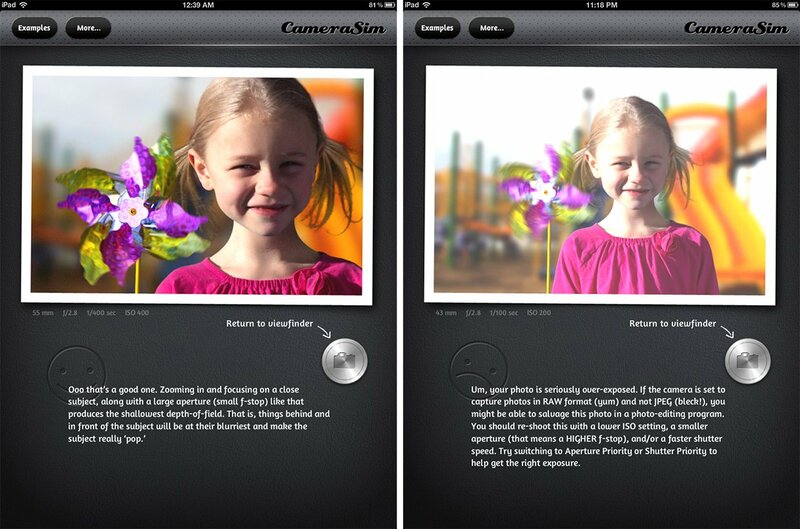 The settings that CameraSim let you adjust are lighting, distance, focal length, ISO, aperture, and shutter speed. You can also simulate being in Aperture or Shutter Priority modes, or go fully manual. There is also a switch to toggle using a tripod or not. In Aperture priority, you will have control over all of the settings except for shutter speed. The reason it's called Aperture priority, is because the main element that you control is the aperture. The camera will then choose the best shutter speed based off the aperture that you want to use. Similarly, Shutter Priority mode gives you control over everything except for aperture. 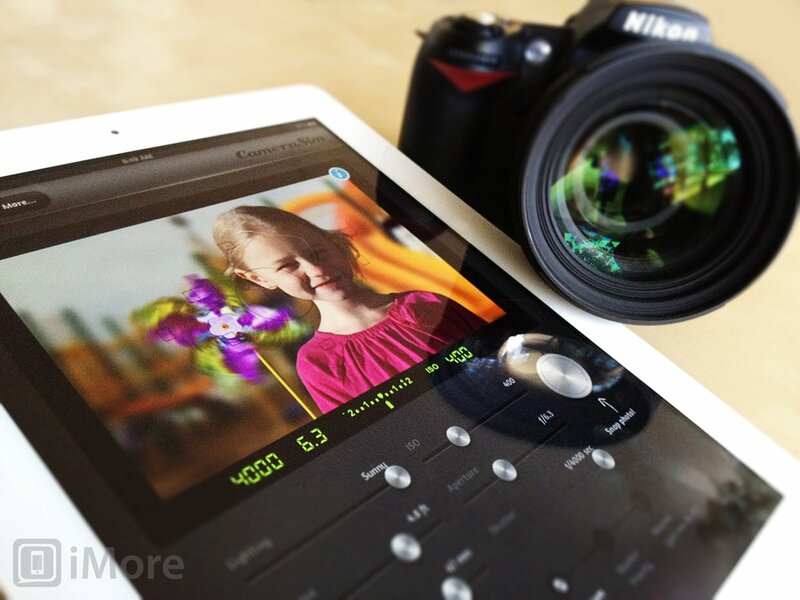 In manual mode, you have full control over all settings. Your DSLR also has all three of these modes and they're typically labeled as A, S, and M.
If the tripod is turned off, then in addition to the motion of the girl and pinwheel, you will also have to consider motion of the person holding the camera -- you. When turned on, you don't have to think about that element and only need to consider the girl and her pinwheel. I will not give you a lesson on how all the different settings actually end up affecting the image, except for mentioning that, visually, your settings will determine how much of your photo is in focus and if you are able to freeze the motion of the girl and/or her pinwheel. When you take a photo, CameraSim will show you what your photo would look like with the settings you chose and give you feedback. If it's great, it will say so, and if could use a little work, CameraSim will give you some pointers for improving your shot. I think CameraSim has done a great job of accurately demonstrating how different settings will impact your photos. My only complaint is that the lighting slider isn't very realistic. It accurately affects how you must adjust your settings for different lighting conditions, but the image doesn't change with the lighting conditions. Even when set to "dim indoors", there a blast of sunlight hitting the side of the little girl's face. Other than that, however, CameraSim is a fantastic tool for learning how the different settings of your DSLR will impact your images. I just wish there was more than one scene to choose from. The photo of the girl is great because you can really get a feel for blurring your background and freezing motion, but I'd like to see at least one scene for each of the 6 lighting options. I think this is a fabulous app for beginner DSLR users who want to learn how to use their camera. The instant feedback and tips are quite helpful. I'd venture to say it's even a must-have app for beginning photographers who are confused about settings and uncomfortable using their camera in anything but auto mode.